Yesterday I was in Stowe, Vermont scouting locations for a future shoot. 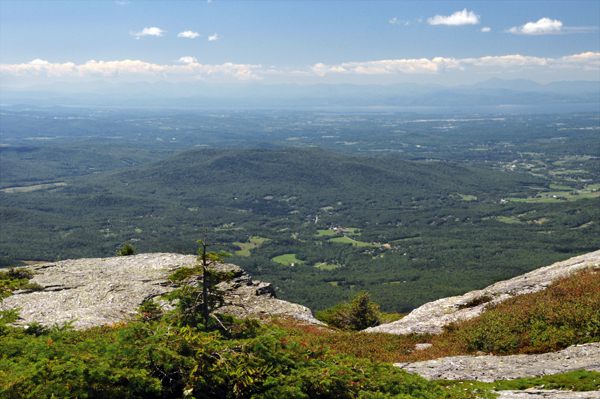 In this view to the west, you can see Lake Champlain and beyond it, New York’s Adirondack Mountains. Stowe is a lovely town – a popular skiing destination but it also has a lot to offer during the summer months. There’s a pretty good chance you’re familiar with one of the families that’s a fixture in the area – the von Trapps. If you’re a fan of The Sound of Music, you’ll recognize that name. The family emigrated to Stowe in the 1940s after having fled Nazi Germany – it reminded them of the home in Austria which they were forced to leave. They opened a lodge there in the 1950s and have been welcoming guests ever since.